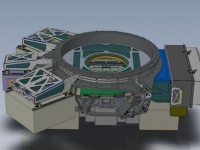 J-PAS (Javalambre Physics of the Accelerating Universe Astrophysical Survey) will cover at least 8000 deg2 in approximately 5 years, using an unprecedented system of 56 narrow band filters in the optical. The filter system was optimized to pursue three main scientific goals: first, to accurately measure photometric redshifts for galaxies up to z~1; second, to study stellar populations in nearby galaxies; and third, to resolve broad spectral features of objects such as AGNs and supernovae. 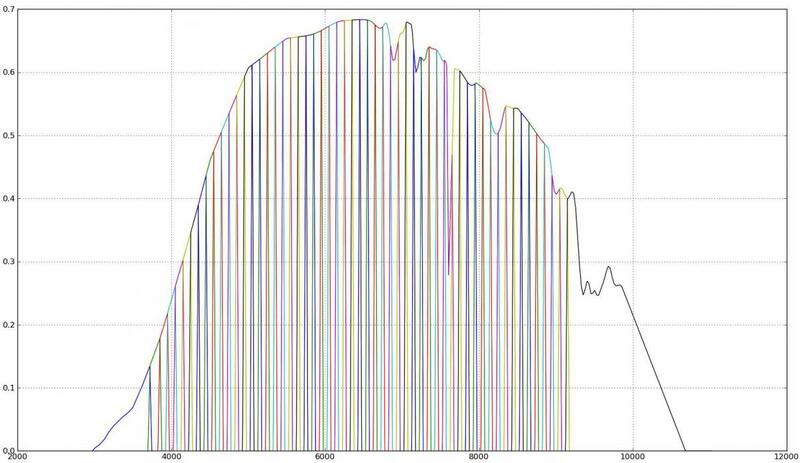 The expected throughputs of the filters (including the CCD quantum efficiency, aluminum reflections and telluric lines) are shown in the figure below. Figure 1. Expected throughputs of the filters. 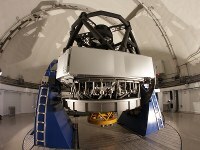 The main J-PAS instrument is a 2.5 m telescope with an effective field of view of 7 square degrees. That instrument has an étendue of about 26 m2 deg2, which is on a par with other state-of-the art instruments dedicated to wide-area astrophysical surveys. We expect to measure positions and redshifts for more than 14 million red, luminous red galaxies (LRGs) with L>L* and an apparent magnitude equivalent to iAB < 22.5. In the redshift interval 0.1 < z < 1.2, we expect a photo-z precision of σz ∼ 0.003(1+z). The population of LRGs has a number density n > 10-3 Mpc-3 h3 galaxies within the ~10 Gpc3h-3 volume to be sampled by our survey. This high density ensures that the error in the determination of the BAO scale is not limited by shot noise. By itself, the J-PAS LRG survey will deliver precisions of order <4% in the dark-energy equation of state parameter w (if assumed constant), and can determine its time derivative when combined with future cosmic microwave background measurements. In addition, J-PAS will yield high-quality redshift and low-resolution spectroscopy for hundreds of millions of other galaxies, including a very significant high-redshift population. The data set produced by this survey will have a unique legacy value, allowing a wide range of astrophysical studies. 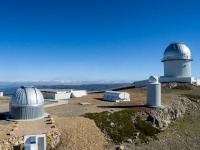 The Observatorio Astrofísico de Javalambre is an astronomical Spanish ICTS particularly devoted to carry out large sky astronomical surveys with two large field of view telescopes, state-of-the-art panoramic instrumentation, and an unprecedented set of optical filters. 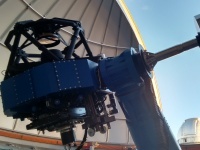 JST/T250 (Javalambre Survey Telescope) is a 2.55m, F#3.5 alt-azimuthal telescope with a Ritchey-Chrétien-like configuration with a large field of view of 3 deg diameter, particularly defined for carrying out large sky photometric surveys like J-PAS. 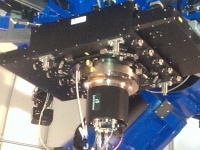 JPCam is a wide field 14 CCD-mosaic camera that will be installed at the Cassegrain focus of the JST/T250. It is intended for surveys with JST/T250 starting with J-PAS. The mosaic of 14 large format CCDs covers a large fraction of the JST/T250 FoV with a pixel scale of 0.2267"/pixel. The data archiving and processing of the images collected at the OAJ will be carried out in the Unit for Processing and Data Archiving (UPAD). 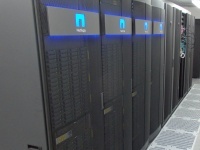 This data center will provide the hardware infrastructure needed to store, process and analyze the images, as well as keep data backup. It will also have the provide efficient access to the scientific database and sky images for the astronomical community and the general public.